I’ve written about animals before. (See the Recent Posts list on the right side of this page: “The Therapy of Pets”- January 17, 2014.) Animals are the ultimate stress reducers. Last weekend, I went on a day trip to visit an unusual, animal rescue compound near Solvang, California. They had a variety of animals including miniature donkeys; I never knew such a creature existed. The full-grown mini-donkeys came up to my waist. 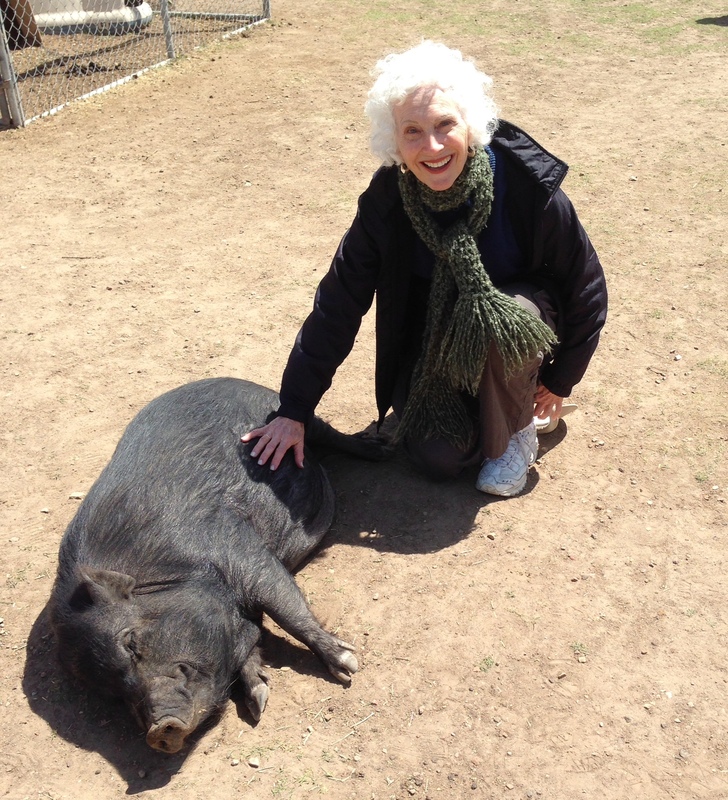 Here I am with Princess, a Vietnamese Potbellied Pig. While I was scratching Princess’ belly, currycombing a donkey, or petting a tortoise, I forgot about all my commitments, obligations, must-dos, and everything else in my life that stresses me out. Many animals are so calm, placid, easy-going, and relaxed. (Those terms may all mean the same, but I couldn’t stop with the descriptors.) When hanging around them, those qualities spill over onto you. That’s why hospitals and other institutions often bring in animals for the occupants; it’s therapeutic. It is so much better, cheaper and has less negative consequences than many of the methods people use to reduce stress: alcohol, prescription medications, illegal drugs, smoking, excessive caffinated drinks, etc. Because of the danger to our lives, health and happiness, we must reduce the stress that life hands each of us. One thing I use is exercise. When I’m working on the exercise machines at my gym, I’m concentrating on the workout and not on my stressors. Animals have that same effect on me. Since I don’t have an at-home pet in my life right now, I’m always going up to people walking their dogs to get my “animal hit” for the day. I ask the owner first if I can pet his/her dog. Afterward, I always thank the dog and the owner for sharing. Try an “animal hit” whether it be your neighbor’s dog, cat or bird, or a more exotic variety such as Princess. Let their calmness wash over you and accompany you throughout the day. Somehow, it puts in perspective all of the little concerns we think are so important and that we allow to drain so much of our energy. Please forward this blog to others. To read my previous blogs, scroll down or read them under “Recent Posts” and “Archives” on this page. If you’d like to be on my blog email notification list, click here on my book website: AdventuresWithDadTheBook.com and leave me a message under the “Contacts and Links” tab. I’ll be one of several storytellers at SHINE Storytelling, April 17, 2014, 7:30pm, 2019 14th St., Santa Monica, CA 90405 ($5 donation at the door) on the theme for the evening: Taking the plunge. I’ll talk about going from retired probation officer to actress via a senior acting class I took with my 85-year-old father, and overcoming my stage fright in the process. Check out SHINE’S website at: storiesbloom.com/StoriesBloom/SHINE.html. I’ll also be giving an author talk/book signing at the Savvy Seniors of Calabasas on April 24, 2014, 1:00 to 2:30pm, Calabasas Library, Founders Hall, 200 Civic Center Way, Calabasas, CA 91302 (preregistration and $5 fee required). As part of my talk, I’ll discuss the process of writing my memoir, editing it, finding a publisher, and promoting it. Now, onto my blog: Have you ever been cut out of something you were sure was a shoe-in for you like a job promotion, a relationship, or even an appearance on a TV program as happened to me last week? As I blogged about last time, I am one of 60 women profiled in Marlo Thomas’ new book: It Ain’t Over…Till It’s Over. I was contacted a few weeks ago and told I was one of the subjects chosen to be on the Today Show in a video clip in conjunction with Marlo Thomas’ appearance to discuss her book. I jumped though all the hoops they asked for with a very short deadline. I taught myself how to make a short, selfie video on my iPhone. I taught myself how to upload it to a file sharing website as it was too big to email. I searched for some requested photos buried in my desk drawers of myself at my office when I was a probation officer which I then scanned and emailed. My stress level was way up there as you might imagine. On the day of the show, I watched only to discover that I had been cut out. I was very upset as well as embarrassed because I had told everyone I knew that I was going to be on the Today Show; posted it on some online, group discussion sites; and blogged about it right here. After wallowing in “poor me” for awhile, I was able to put it in perspective and turn it around. What had I gained? Well, there was my photo and a lovely story about me tracing my journey from probation officer to actress in Marlo Thomas’ book; I learned how to take a selfie video for when I might need to do it another time; I learned about file sharing websites; and I got a blog subject out of it. When something like this happens, we have choices. Of course, we all have to wallow in self-pity for awhile; that’s human nature. But, wallowing for too long is unproductive and destructive. We do have choices; we can choose to move on and get over ourselves. How long it takes is up to us. Please forward this blog to others. To read my previous blogs, scroll down or click on “Recent Posts” and “Archives” on this page. If you’d like to be on my blog notification list, click here on my book website: AdventuresWithDadTheBook.com and leave me a message under the “Contacts & Links” tab. Marlo Thomas’ new book entitled: “It Ain’t Over…Till It’s Over: Reinventing Your Life–and Realizing Your Dreams–Anytime, at Any Age,” has just been published. It tells the stories of 60 women who have reinvented their lives, and I’M IN THE BOOK. A promotional campaign has just been launched, and Marlo Thomas will be interviewed on The Today Show to promote her book. I will be in a short video clip as part of her interview on the show, and I’ll be telling my story of retiring from my 37-year career as a probation officer and becoming an actress in my senior years. In Los Angeles, CA, it will air Monday, April 7, 2014 on NBC between 8am and 9am, and again between 10am and 11am. Check the NBC website for show times in other areas. Watch it if you can! Now, onto my blog. I always used to be so afraid of being alone. I don’t mean alone for a few hours; I mean alone in life. That fear seeped into my everyday activities and still influences me. How many more decades is that going to continue? I don’t have that many decades left. I must do something now. I’m sure some of my poor decisions in a few prior relationships stemmed from that fear–better someone than no one. How many people remain in bad, destructive marriages, relationships, or friendships because the alternative, being alone and unloved, seems worse? I did. I remember in junior high school that if you were seen by classmates outside of school engaged in activities like clothes shopping, going to the movies, etc. by yourself, or worse–with your mother, you’d be considered as someone who didn’t have a pal to go with–a loser. A friend recently confirmed that she’d had the same fear, and still does. Now, as a senior, I’ve learned to do many things by myself without a second thought. However, there are still some activities that I avoid if I don’t have a companion. I don’t travel alone; I don’t go to a movie alone; I don’t go to a restaurant alone. I reject those pursuits automatically without consciously thinking about them. Recently, I wanted to see a movie that all my friends had already seen. I simply told myself that I’d catch it on Netflix, and I moved on to thinking about something else. I know a lady who travels all over the world by herself. I admire her–envy her. I’d like to be able to do that–just call a travel agent and be done with it. Even though I’m a personable woman and attract people easily, deep down inside I’m afraid that if I travel alone, no one will talk to me; they’ll look at me with pity or scorn because I don’t have someone to be with. On a conscious level, I know that’s ridiculous. On a subconscious level, that old lesson from junior high school still controls me. I’ve broken so many old bonds and blossomed as a result. I want to break some others. How about you? Please forward this blog to others. To read my previous blogs, just scroll down or click on the entries under “Recent Posts” and “Archives” on this page. If you’d like to be on my blog notification email list, click here on my book website: AdventuresWithDadTheBook.com and leave a message under the “Contacts & Links” tab.